While reading a copy of the National Geographic, I came across 2 things I've never heard of before, so decided to investigate. One was about wild horses, and the other prompted me to wonder about the trust between a horse and its rider. I've never heard of the konik (the name means ‘small horse’ in Polish), or the tarpan, yet it wasn't difficult to find out about them. The konik is a breed that has been bred back to try to develop horses that look like the tarpan. The tarpan is an extinct subspecies of the European wild horse, which was hunted to extinction in Britain in Neolithic times. The name tarpan is from a Turkic language meaning ‘wild horse’. The last wild tarpans were captured in the mid- to late-19th century; the last captive tarpan, a stallion, died around 1910 in Moscow Zoo. Koniks are usually promoted as being tarpan but are not direct descendants. In 1936, the Polish konik, small, tarpan-like horses, were used in an attempt to breed-back th tarpan. But, apart from its colouring – grey, with a dorsal stripe and zebra barring on the legs – no one could agree on their characteristics. Did it turn white in the winter? Was the mane floppy or erect? Yet another rare breed I'd not heard of before, the sorraia horse, found in isolated regions of Portugal, remained unknown to science until the 20th century. 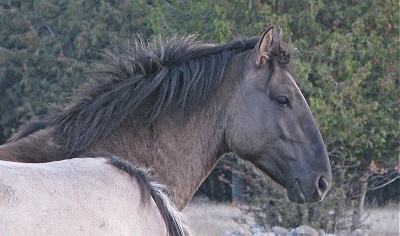 Although more genetic analysis needs to be done, some scientists suspect that the sorraia may be a variation or relic of Equus ferus ferus. I love that noble-looking profile. Anyway, back to the konik – its importance is down to their grazing habits; they make wetlands more habitable for other species by eating the woody vegetation that overcomes marshy areas. They are now ‘employed’ by conservation grazing projects throughout Europe. The Wildwood Trust led the way for the re-introduction of the konik to Britain in 2002, in southern England. There is also a herd in Scotland. Apparently, foals have been successfully born to these herds here in the UK. That's now on my to-do list -- to check these horses out. The other picture-article was to do with a Spanish festival -- can I blame my ignorance on never having been to Spain *lol* Las Luminarias de San Anton, a Spanish festival, celebrates the feast day of St Anthony, the patron saint of animals. Each January, in the village of Bartolomé de Pinares in central Spain, riders jump their horses through a string of bonfires! The tradition apparently began about 500 years ago, during a time of sickness. It's believed that e smoke and fire blesses the horses and purifies them, strengthening them for the coming year. The horses are doused with water beforehand to prevent their coats from singeing. It is mind-boggling looking at pictures of horses jumping through fire when you know it’s surely something they would refuse to do. Animal rights activists have been campaigning to have the festival stopped, arguing that it’s cruel to force horses to take part. The riders, however, say that their horses are used to it and do not suffer. I’ve watched a clip on Youtube and it doesn’t look as if the horses are forced to do it; some ride around the bonfire, and those that refuse aren’t made to go through … unless that’s been edited out. Am I being cynical? Yet, in the pictures, the horses don’t look spooked … then again, I ain’t no equine expert. Certainly has the ‘wow’ factor though.